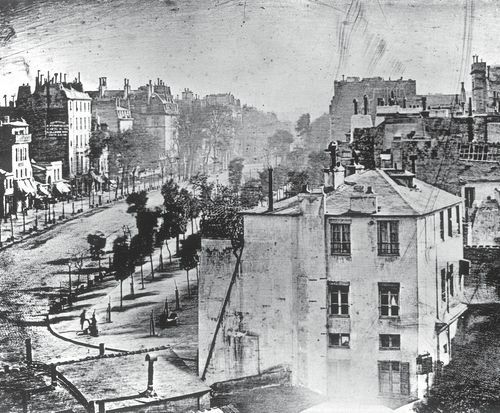 Daguerre's exposure time was so long (likely between 10 and 20 minutes) he could not capture the moving figures and traffic on this bustling Paris street. Only a man who remained still while a bootblack polished his shoes was recorded, making this anonymous individual the first person to be photographed. From the New York Observer. The following is an extract from a private letter of Professor S. F. B. Morse to the editor of the Observer, dated, Paris, March 9th. . Republished in The Farmers' Register, Vol.VII, No.5, May 31, 1839, p.258. "Objects moving are not impressed. The Boulevard, so constantly filled with a moving throng of pedestrians and carriages, was perfectly solitary, except an individual who was having his boots brushed. His feet were compelled, of course, to be stationary for some time, one being on the box of the boot-black, and the other on the ground. Consequently, his boots and legs are well defined, but he is without body or head, because these were in motion."